From 1991 to 2004, as the owner of Serendipity’s Backyard, a bookstore and yoga studio in the heritage fishing village of Steveston, on the west coast of British Columbia, I welcomed many young people through its doors. Filled with an essence of mystery and magic, the store was a sanctuary for those called into the inquiry of the infinite portals for living and experiencing this precious human life. Called by so many young women’s longing to work or be in the store, and tending what Joseph Chilton Pearce (author of From Magical Child to Magical Teen) names as an “ideal window created by nature” in our early teen years for a “shift of mind into higher consciousness” (the “biological need for transcendence”) I created Teen Circles. The teen circles became a time of sharing silence, storytelling, movement and sound, dreams and creative process through writing and painting. At the beginning of each year we created, in collage, visual themes of inquiry through images gathered in magazines. After thirteen years, I sold the store and a core group of young women graduated High School, left for University, and after seven years, the Teen Circles came to a close. The following summer while preparing for a move I discovered a box full of the original collages made in the Teen Gatherings. Over a hundred in all, they leapt from the closet, like birds from an opened cage. Moving images from the first issues of Oprah Magazine, National Geographic and Yoga Journal of archetypal themes, markers of change and portals of mystery, looked back at me. Some of the young women also collaged their own image into the pieces. Upon connecting with a few of the women, we decided to gather and make smaller card size copies of all the images so that each of us would have a deck of inspiration and remembrance of our time together. As the summer unfolded we met and created questions for each collage in a circle of inquiry in this new phase of our journey. We decided collectively that so many decks tell you something, and that our times together were about inquiry. Forty-eight images called to be used, and a wild card for mystery. The first printing became a fundraiser for two of the young women who were going on cross-cultural excursions in Africa and Indonesia. And now a second printing is in the world, as these questions just simply won’t go away! 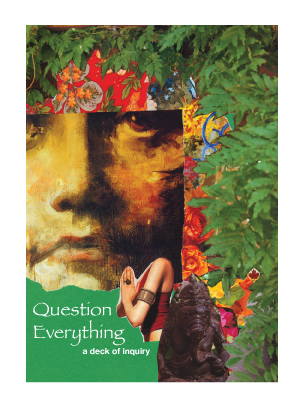 All profits from the sale of Question Everything will continue to support youth involved in sustainable and cross-cultural relations in the world, both locally and globally. In these great times of evolutionary promise, may we commit to asking the questions we must ask, tend the essential questions that can never be answered, and make the necessary inquiries of unquestioned cultural habits and beliefs that clearly do not serve the continuation of flourishing life on this beautiful blue-green planet we call home. May Question Everything support you in “living the questions” of your life. I love QE and I love the blog and I am so grateful for this mysterious process that started so many years ago. QE feels like a magical thread that holds meaning and relationships together…and it’s a web that continues to widen and include more and more precious souls in a shared inquiry.